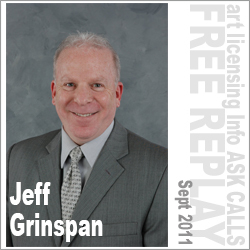 Jeff Grinspan has been in the art licensing business for over 24 years, and his company, Grinspan & Co. consults frequently with individual artists to help them construct an ‘architecture’ for starting and running a successful art licensing business and with a wide range of manufacturers on the business of art licensing. With a background in licensing with top notch companies such as Sakura and Wild Apple Graphics, and his works with the SURTEX trades sow, he brings tremendous knowledge to share with you. In the interview, Jeff covers how to get started in art licensing, the five traits that offer artists greater success, critical mistakes when submitting to manufacturers, and working relationships with manufacturers.